It's time for another FUN Challenge over at the Double D Challenge Blog. I will admit, right here, right now, that these are difficult cards for me to create, almost as tough as making a CAS design.....almost. But this is what I came up with. I think at one point I just kept adding layers lol They don't call it a Challenge for nothing! I must say this was kind of fun to create. No sentiment.....I have a bad record with all white cards and inks! Wow, with all of these layers your card is fabulous. I can just picture you in your craft room, music going, and you don't stop until it is done. 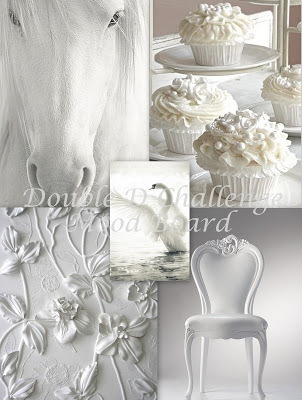 Beautifully created Donna and one would never know you struggle with all white as you nailed it! Love all your pretty layers and dimension and how it all flows so beautifully together!! Hardest part for you must be doing without your papers. Gorgeous design and lovely layers. Your are right white in white is about texture and dimension and you captured them both in this gorgeous card. Wowie, Donna! I'd never guess this was difficult for you because it looks like you knew exactly what you were doing and it turned out amazing! LOVE all the dies you used and your willy nilly pearls. Birds always add a touch of sweetness, too. I've been admiring this card since I first saw it. Donna my dear this is GORGEOUS!! Love the layering and delicate dies. Pearls always add a classy touch. Well done!! Oh my GEEEEE!!!! Just look at all those luscious, lovey layers. I LOVE it!!! This is a stunning work of art, it wants a frame! You have outdone yourself here, my dear. TRULY!!!! Beautiful card, Donna! Just adding layers seemed to do it for you! You came up with a gorgeous combination!!! Is a winner for sure!!!! Gorgeous, Donna!! Every...last...willy, nilly, detail! So many layers to admire. I couldn't make a CAS card to save my life either. Very elegant and absolutely gorgeous Donna! love all the trimmings and the way you have put it all together - a real stunner for me. You are the layering queen of cardmaking after seeing this gorgeous creation! I don't know how you managed to use all those beautiful dies and elements, but they all work impressively together! I absolutely love this!